There hasn’t been any new affordable senior housing in Boston funded in many years. That’s about to change. 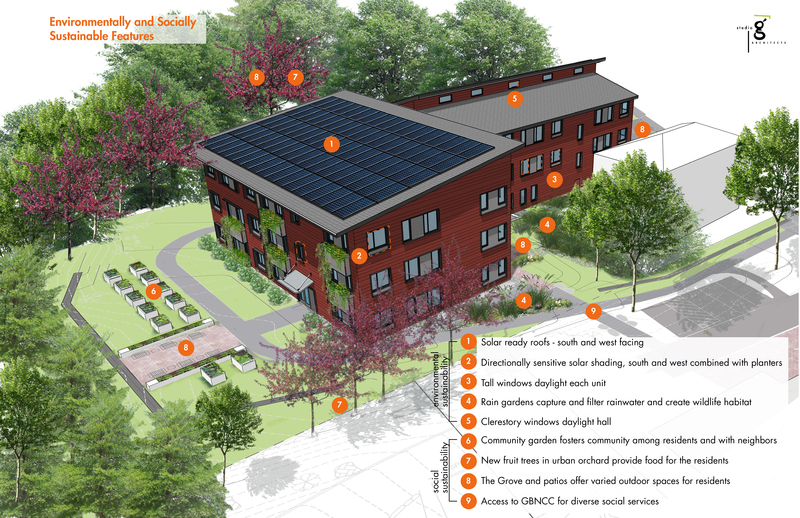 Studio G Architects has teamed up with Greater Boston Nazarene Compassionate Center (GBNCC) and Nuestra Comunidad Development Corporation to respond to a developer RFP from the City of Boston. The team designed 30 one-bedroom units of high-quality affordable housing for 62+ independent seniors at 150 River Street in Mattapan, Boston. The broad vision of the project is a welcoming, neighborhood-scaled building that encourages community interaction indoors and out. Several community amenities are designed into the project, providing support and services for residents. We are excited to be part of a local, community-based development team. GBNCC is headquartered next door and has been providing services to the neighborhood for years. They want to help house Mattapan seniors at risk of losing their housing. Our high performance sustainable design further reduces costs for residents and makes the project a model for the area. The City of Boston’s Department of Neighborhood Development (DND) organized a community meeting to review the three proposals on Wednesday, June 13th at 6:30pm at the Foley Building at 249 River Street in Mattapan. The team includes two non-profits with complementary strengths: GBNCC, a social service center offering extensive support services for residents of Mattapan and Dorchester, that also serves as a supportive link to wider social and economic services and Nuestra Comunidad, a local Community Development Corporation specializing in building high-quality affordable housing and economic development in Boston’s neighborhoods. GBNCC provides services such as: a food pantry, women’s health programs, ESL and English literacy programs, utility assistance, and a computer lab. The proximity of GBNCC facilitates the use of these social services. GBNCC brings several partnerships such as: Mattapan Health Center, Adult Day Care Providers Kay Pam and Sant Belvi, and Mattapan Food and Fitness that will help provide services. This location facilitates life without a car. 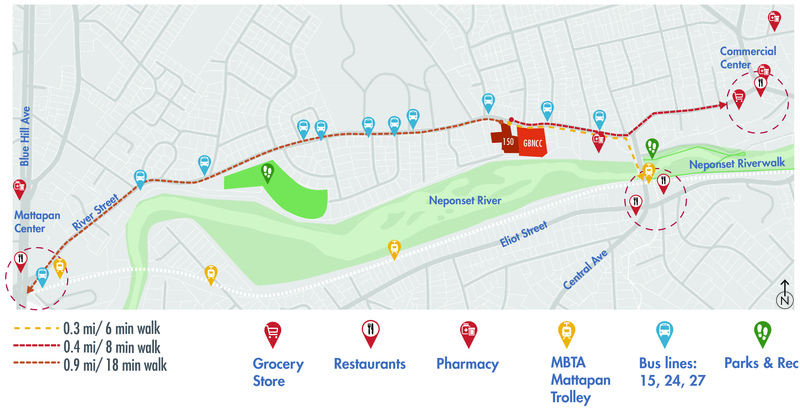 River Street has 3 bus lines, and the site is within a 6 minute walk to the Central Ave Mattapan Trolley stop, and an 8 minute walk to a grocery store and other shopping amenities. There are walking trails along the Neponset River nearby and 3 commercial centers within a 20 minute walk or shorter bus ride. Low-impact development techniques ensure the building footprint and paving is compact to preserve and improve the existing conditions. Enhancements include a community orchard, called The Grove, raised planter box community gardens with a patio to the south, and rain gardens with a patio on the east and north. Two accessible parking spaces are adjacent to the middle entrance, while an accessible drop-off parking spot is available at the front entrance. 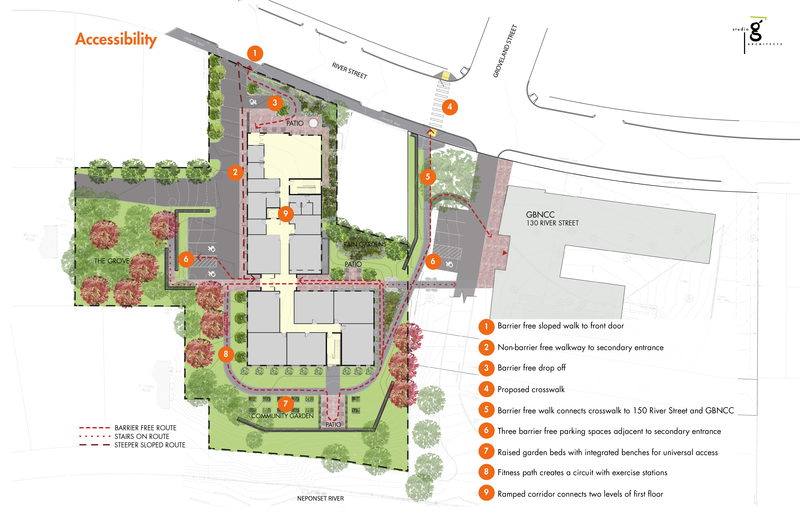 More parking is available on the GBNCC site, connected with a pathway. The landscape design aims to create outdoor gathering spaces of different varieties to respond to the needs of the residents and corresponding to the season. For example, a shady north facing porch is great for sitting in the summer, whereas a south facing garden patio is better for spring or fall. The landscape is designed to be multi-sensory and productive, from fruiting trees, to edible buffers (think berry bushes), to food production and the creation of bird and butterfly habitats. The rain gardens double as habitat and stormwater management, as well as providing a beautiful back drop to a patio area. A fitness walk is built into the paths around the building, with signage encouraging different exercises. 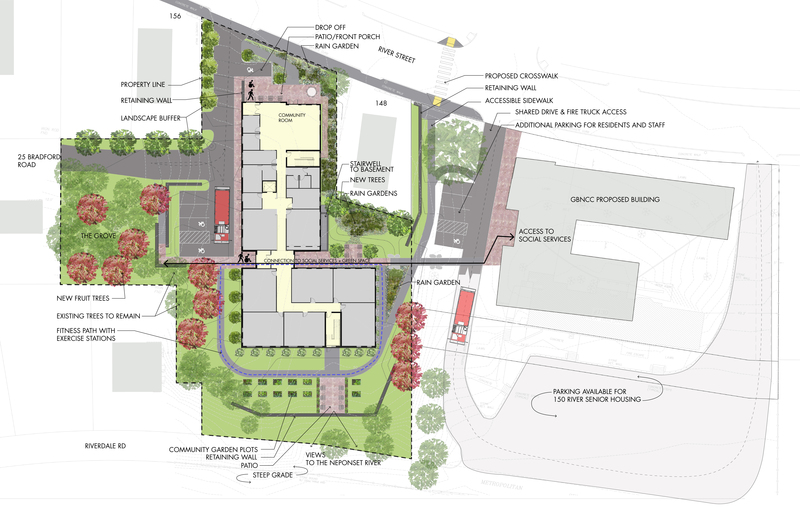 The project is designed for aging in place and universal access. The design responds to changing abilities and needs over the life of a resident. Entering just off River Street, residents arrive at a community room, with a kitchen, capable of hosting a range of events from knitting groups to dance parties and celebrations. A fitness room, shared laundry room, flexible meeting room and restrooms are adjacent. A resident services coordinator office and lounge space with comfortable chairs also serve the residents. The community spaces are clustered to encourage social interaction. There are reading nooks and space for a free community library on each floor at the joint connecting the two buildings. Accessibility is critical. All the units have clearance for a wheel chair or walker in all bathrooms and all kitchens. There will be grab bars in all bathrooms. All units are designed to be adaptable over time for varied disabilities, including wheelchair use, vision, and hearing impairments. Though the site is quite sloped, each of the main entrances are at grade to ensure accessibility. The first floor corridor is ramped to avoid steps. The building takes design cues from the neighborhood. The sloped roofs, three story height and siding echo the surrounding structures. Large windows bring in daylight. On the South and West facades, shading devices merge with window planter boxes. The building will be well insulated, with high quality windows, and continuous fresh air to ensure lower utility bills and a healthy indoor environment. Solar panels, provided with a power purchase agreement, will top the west and south facing roofs, while the east sloping roof will shed it’s water into the thirsty rain garden below. In the spring of 2017, the Studio G team presented to over 80 neighbors who came to see the proposals. GBNCC’s proposal was very well received. Please join us for the next City of Boston community meeting on Wednesday, June 13, 2018 at 6:30pm at the Foley Building at 249 River Street, Mattapan.